"With God ALL is possible"
Mark it on your calendar...Family Camp 2018 begins on Friday July 6, 2018 with the opening banquet and ends on Thursday July 11, 2018 with morning with breakfast. ROOM RESERVATIONS .... Can be made at your earliest convenience, rooms are filling up and we will do our best to accommodate your requests. "With God ALL is possible!" July 6 - 5:30 p.m.
Bon Fire - Sing-a-long following the banquet at 8:30 p.m.
Saturday July 7 - 9:00 a.m. To 11:00 a.m. ANNUAL BETHEL PARK MINISTRIES BUSINESS MEETING. While it may seem like a repeat of last year, we had great response from campers and have asked our speakers to return. They come with a new and fresh anointing and message for all who attend. Rusty Railey is a ministry veteran of almost 20 years most noted for his innovative approach to ministry. Rusty is known for his unique ability to bring the Word of God to life in ways that challenge and inspire the heart of a believer. His relevance and genuine love for others as well as his driving passion to see all experience a relationship with God appeal to people of all ages and backgrounds. Victoria’s heart is not only to be an inspiring mother and encouraging wife, but to also communicate God’s Word with warmth and laughter, inspiring other ladies to pursue a more intimate relationship with Him. Her passion is to see herself, her family and others embrace the joys of walking with Christ in everyday experiences. Victoria has been a teacher specializing in reading and kids with disabilities for 10 years before being full time in ministry with her husband, Rusty. She enjoys drinking coffee, nutrition, fitness and creating memories with Rusty, Ruthie and Vera. Rusty Brings with him his worship leader Aaron Pino. 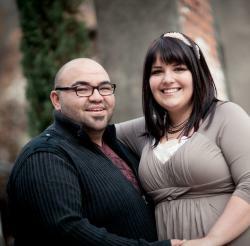 Aaron & Ashlee are graduates of Christ For The Nations where they met and fell in love in Dallas, Texas. Together, they’ve had the privilege of preaching the gospel to thousands of people all over the world. They have ministered for over a decade in a variety of capacities including: Worship Pastors, Youth Pastors, and conference speakers. They bring a prophetic worship experience that will take you in to new realms of God, as well as carry a message that is powerful, relevant and inspiring. Their passion is to see people’s lives changed through the power of God in worship and the declaration of God’s Word. They have been married since September 2008 and are blessed with two children, Max and Bella. They love exploring new places and cultures, playing games, and hanging out with family and friends. will be the guest speaker for our German services. will be "SOWING the WORD" into the lives of the children! Silvia Coffing shares a special testimony.